Another Full Irish Breakfast to begin the day. We anticipate the cold, so we eat heartily. At check out, we even score a gift of a half-loaf of Irish bread. Again, the happy dance. We load the coot coupe and get our first look of Doolin in the daylight. A lovely seaside town hugging the coastline. Into the CD player, Friars Green. You can’t tour Ireland without its very own soundtrack. Our first stop, the Cliffs of Moher. Parking (which includes admission) is 6 euros per person. Visit the Visitor’s Center for history as well as do-dads rich in Cliffs history. We opt to stop afterwards, for there’s a small window of time which promises sunlight. From this point, it’s 200 yards to the cliff edge. You will see a Liscannor slate edge, added due to too many adventure seekers becoming fatal statistics. Once you experience the wind gusts, you’ll understand their necessity. Even today when gusts are minimal, I hang onto Len tightly. At the highest point of the Cliffs is O’Brien’s Tower, built in 1835. The cost is 2 euros each to climb to the top, definitely not worth the price. The view doesn’t change. At one point, an entrance to the Cliffs of Moher Coastal Walking Trail which links the villages of Liscannor and Doolin. You’ll capture views of Hags Head, the Cliffs of Moher, Aill na Searrach, the Aran Islands and the Galway Bay. The path (app. 3 miles) is protected while at the Visitor Center but suddenly changes to a remote, challenging and demanding trail offering no barriers, handrails or fencing. The warning to all those who enter is clearly marked. Being curious, Len hiked about 600 yards to the next point and returned with a new respect for Mother Nature. Grateful for visit to the Cliffs of Moher, we continue through The Burren (Burren National Park). It’s literal translation, “the rocky place.” This area is a 10-square mile limestone plateau that provides no water, sparse vegetation and is a very protected site. This unique ecosystem has flora that managed to adapt since the last Ice Age, 10,000 years ago. Driving through, there are many ancient artifacts and a stark reminder of the harsh life for the people in Ireland. We pass Lemaneh Castle, a shell of a fortified house; Caherconnell Ring Fort, one of many low stone areas; the Poulnabrone Dolmen, a portal tomb surviving for nearly 7,000 years. This is quite decisively the most desolate and unforgiving landscape we have seen. Very other-worldly. Cows graze precariously over the limestone. We stand next to this man-made tomb where remains were found that can be dated back to 4,900 BC - surreal. As you walk away from the tomb, you get a haunting feeling of how the chasm of time is so deep – they were people walking and living here millennia ago, right where I am standing now. It’s hard to wrap your mind around that much time. We’re covering more ground today, so it means we will miss some of our planned stops. We must skirt through Galway, a very modern city and head north. We also miss Connemara in County Mayo, where the most visual remains of the potato famine still exist. We’re heading toward Westport and the Clew Bay Hotel. 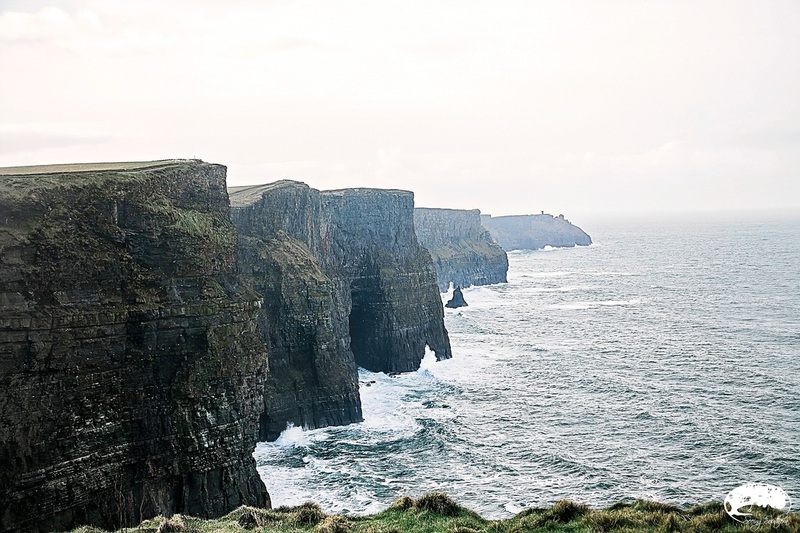 Stretching along the Atlantic coastline in County Clare, the Cliffs of Moher. On a clear day - they say - you can see the Aran Islands in the distance. We have no clear day, and although we can not see in the distance, we see up close one of God's most majestic creations. As before, I imagine it during high tourist season; I do not like that perspective. This something to see in your moment. 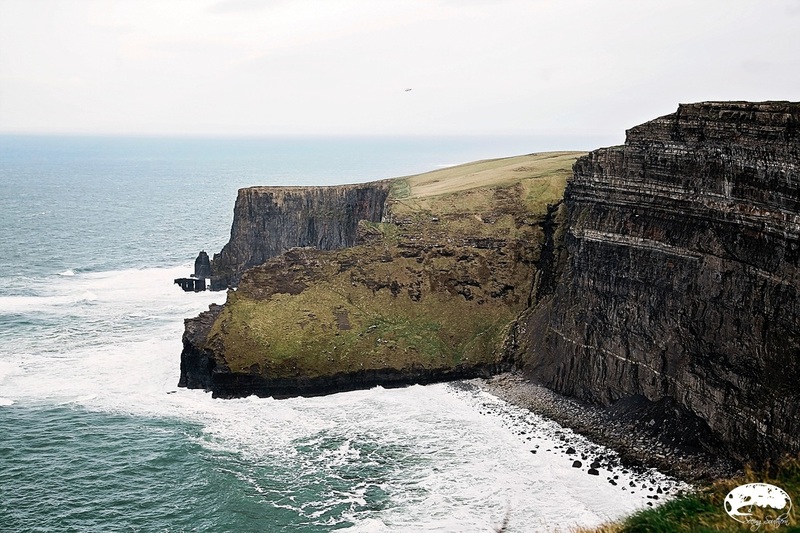 The words Cliffs of Moher translates to "the cliffs of the ruined fort." The remains of the 2,000 year old fort which stood here no longer exists; however, the reason behind building them here still stands. Here (below) is where you leave the park and enter the walking trail. Signs declare their ruggedness and your liability. We leave the park area and make our way north along the countryside. The landscape changes and limestone begins to appear. Here you will find the visitors center for The Burren. Like many other centers, it is closed in the winter. Next door, we find ruins of a 12th century church; one portion without a roof, the other, enclosed and still holding mass. Nothing but a shell, it sits along the countryside. 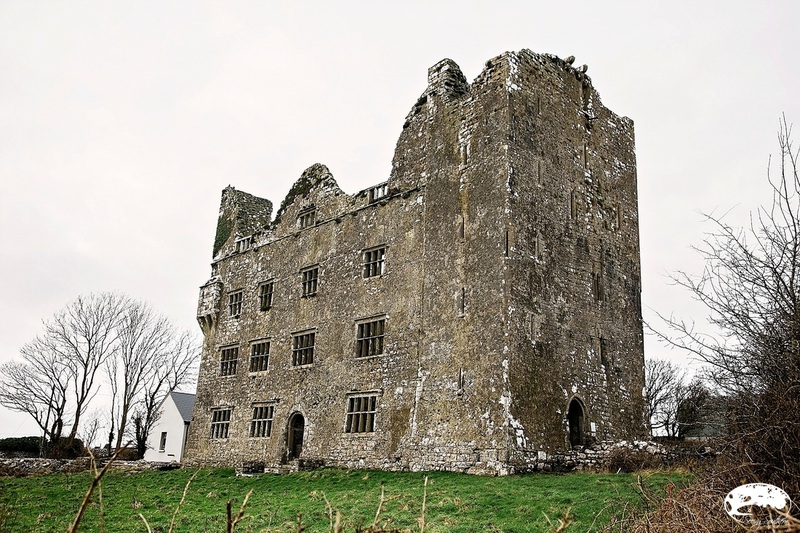 15th century fortified tower house. 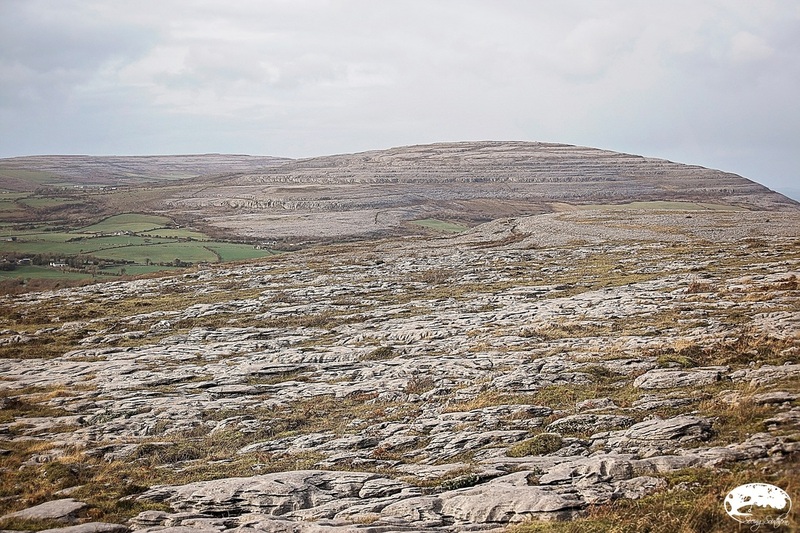 We arrive at the Burren; it is unlike anything we've seen thus far. The portal tomb draws every visitor in for an up-close look. This former seabed - some 250 million years ago - is now blanketed with limestone. A castle that has (finally) been restored well enough for gatherings. No, we didn't get to go inside, but we did take the outside tour. tell us what you think of ireland. Would you like to travel with Seeing Southern a.k.a. Two coots?